Johanna Eleonora De la Gardie was a poet and lady-in-waiting. She was a member of the educated elite of her time. Johanna De la Gardie was born in Hamburg in 1661. Her parents, Beata von Königsmarck and Pontus Fredrik De la Gardie, were members of two of the oldest families in Sweden. It is said that Johanna De la Gardie and her older sister Ebba Maria De la Gardie both received proper educations. They were both culturally active and also produced written work. 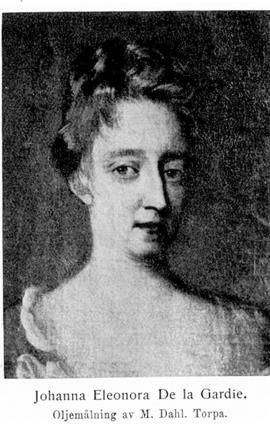 Johanna Eleonora De la Gardie composed hymns, of which only a few have survived. In 1680 Johanna Eleonora De la Gardie was appointed lady-in-waiting to attend to Queen Ulrika Eleonora the elder and, like her sister, she too became one of the queen’s favourites. Unlike her sister Johanna, Eleonora De la Gardie did marry. Her husband was her cousin Lieutenant General Erik Gustav Stenbock and during their marriage she had seven children. She lost two of them in infancy. Amongst those who survived only her eldest daughter lived past her 40th birthday. As her husband took service in the British army, Johanna Eleonora De la Gardie spent many years living in London, and several of her children were born there. During her time in London she also became involved in British courtly life. Little survives of Johanna Eleonora De la Gardie’s written output apart from a short story which was presumably written in honour of the Queen and some German-language hymns. She also had an interest in the theatre, which she shared with her sister and her cousins Aurora von Königsmarck and Amalia Wilhelmina von Königsmarck. The four of them performed the play Iphigenie in 1684. The story, written by the French playwright Jean Racine, played out against the background of the Trojan War. The Queen supported the performance and the unusual composition of the ensemble that performed it, namely an all-female cast of amateurs. Johanna Eleonora De la Gardie’s surviving texts do not reflect the recognition she received from her contemporaries within the educated elite. The last years of her life were marked by illness. She died in 1708 and is buried in the Jacob church in Stockholm. Johanna Eleonora De la Gardie, www.skbl.se/sv/artikel/JohannaEleonoraDelaGardie, Svenskt kvinnobiografiskt lexikon (article by Maria Sjöberg), retrieved 2019-04-23.